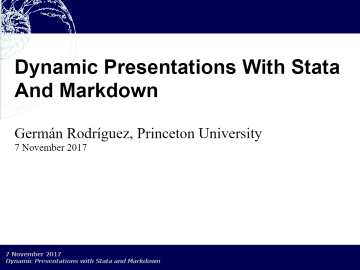 markstat 2.0 leverages the amazing Pandoc to support presentations in HTML using the S5 engine, or in PDF via LaTeX using Beamer. Here is a simple four-slide example. It starts with metadata to define the title, author and date, which are used to generate a title slide. Each heading at level 1 then defines a slide. The rest is pretty self-explanatory. These can be shown incrementally. 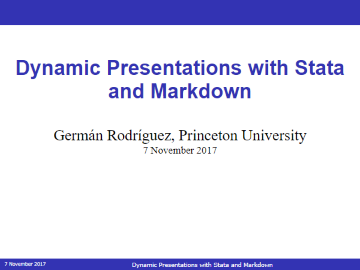 the S5 engine, or PDF slides via LaTeX using Beamer. `s %5.1f 1000*_b[weight]` more gallons to travel 100 miles. can use the strict syntax. As usual, you can include math formulas and/or bibliographic references. 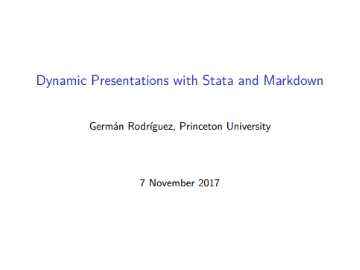 without having to rerun the Stata code, an idea from Ben Jann's `texdoc`. S5 slides also have a printer-friendly outline mode, that you can reach by hovering on the bottom right for the default theme, top right for the Santiago theme, and clicking on ∅. You will also see navigation arrows and a combo box to jump directly to any given slide. 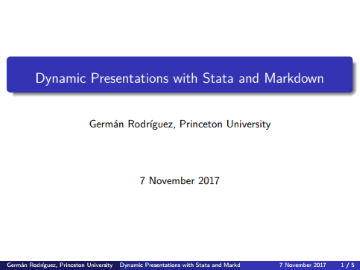 Tinkering with engines and/or themes is facilitated by the nodo option, which lets you change the narrative or the style of the presentation, without having to rerun the Stata code generating the images and tables. For best results I recommend you install the latest version of Pandoc, available at pandoc.org/installing.html. The examples linked here were ran with markstat 2.0.1 using Pandoc 2.0.1.1. For another example see two-column slides.